The first edition of my book Internet Marketing: Strategy, Planning and Implementation from 2001 included a popular template for creating what we then called an Internet marketing plan. Today, marketers are understandably even more hungry for guidance, given the importance of online audiences and digital media for driving leads and sales. Yet, our research on managing digital marketing shows that as many as 50% of businesses don't have a digital marketing plan. That's either integrated into their marketing plan or as a separate roadmap for digital transformation. 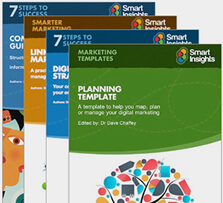 We have now updated the the original plan in my book to create a free to download digital strategy template based on the Smart Insights RACE Planning framework. This template is based on over 15 years' experience of creating and reviewing digital marketing plans for companies and helping students develop them. Learn how to structure a digital plan when you download our 10 page A4 PDF digital strategy template. It will show you the essential online marketing activities that you must work on. This template gives you an outline plan structure based on RACE and recommendations on the essential features of a digital marketing plan. Individual and Business paid members of Smart Insights can use our dedicated Digital marketing strategy and planning toolkit to create and execute their digital marketing plan. It includes a blank Word template workbook for creating a complete plan plus example digital marketing plans. 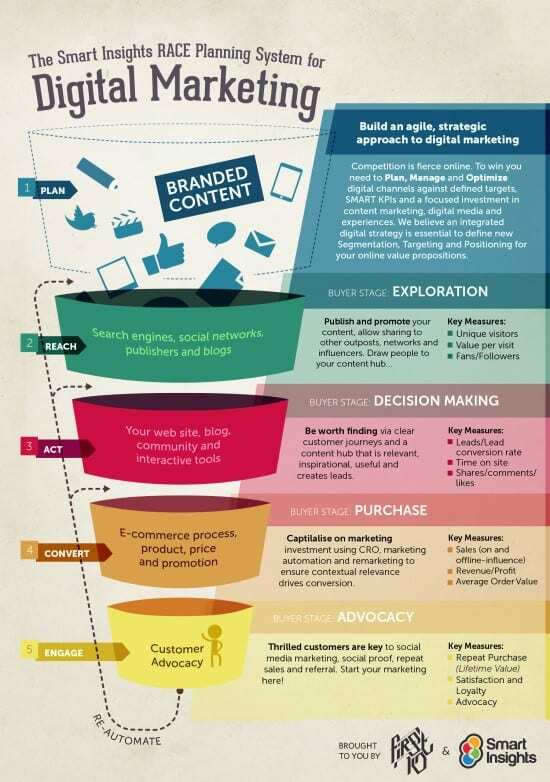 The planning template is structured using the Smart Insights RACE planning framework which covers the key areas of the Digital marketing planning across the customer lifecycle as shown in this chart. If you're interested in creating a digital strategy, see this hub page which collects all of our digital marketing strategy recommendations including guides, templates and blog articles. You can find out more the RACE Planning approach in this post introducing RACE digital marketing planning. Our planning process and thee template references a simplified version of PR Smith’s SOSTAC® Planning System developed by PR Smith, Dave's co-author on Digital marketing Excellence. It's a great framework since it's simple, memorable, and logical. Opportunity - Review current business contribution of digital channels through refining dashboards and set future objectives based on an in-depth marketplace review. Strategy - Create overall digital channel strategy or specific strategy focused on customer acquisition (Reach), Conversion (Act and Convert) and customer retention and loyalty (long-term engagement). Action - Details of specific tactics to implement the strategy such as planning and integrating content marketing, SEO, social media and email marketing into marketing campaigns. We use this simplified approach since we have found through experience in creating many digital marketing plans, that setting objectives for digital marketing activities works best when part of a process of reviewing existing digital channel performance using analytics (as part of situation analysis) and sales reporting systems combined with reviewing KPIs used for control. It can also sometimes be difficult to separate tactics and actions. We have another more in-depth post and infographic on how to use SOSTAC®.